Who Was Pope John Paul II? Pope John Paul II was born on 18 May 1920 in Poland and was the Pope from 1978 to 2005. 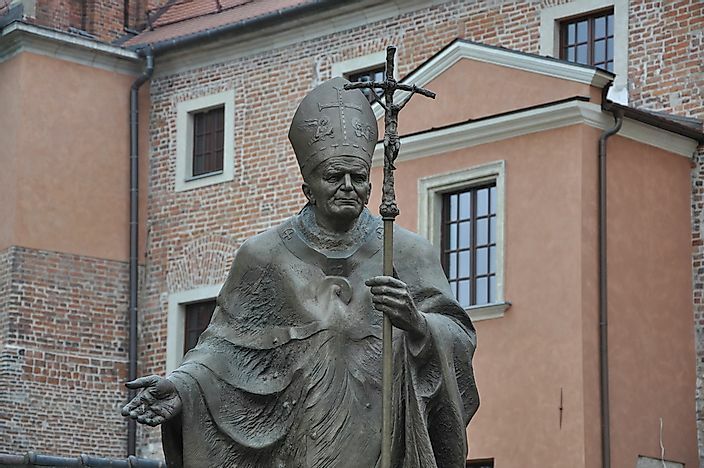 A statue dedicated to Pope John Paul II in Krakow, Poland. Pope John Paul II was born on May 18, 1920, in Poland and was the Pope from 1978 to 2005. Before he was elected the Pope, John Paul was known as Karol Jozef Wojtyla. In 455 years John Paul was the first non-Italian Pope and also the first from a Slavic region. John Paul traveled to far greater distances than popes before him and extended his influence beyond the church. John Paul issued apologies to groups of religious communities such as the Muslims and Jews for wrongdoings by Catholics. John Paul II was born Karol Jozef Wojtyla on May 18, 1920, in Wadowice, Poland. Wojtyla was the last born child of Karol Wojtyla and Emilia Kaczorowska who died during childbirth in 1929. Wojtyla had two siblings, a brother named Edmund whom he was very close to and an older sister named Olga who died before he was born. As a young boy, Wojtyla excelled in sports specifically football which he played as a goalkeeper. In a town comprised of Jews who accounted for one-third of the population, Wojtyla had contact with the Jewish community often playing on their team during football matches. During mid-1938, Wojtyla and his father who was the only remaining family member he had relocated to Krakow. Once in Krakow, Wojtyla enrolled at the Jagiellonian University where he studied philosophy and other languages. Since military training in the Academic Legion was compulsory, Wojtyla participated but declined to fire a weapon, and he also worked as a Librarian. While at the University, Wojtyla learned about 12 languages 9 of which he extensively used during his years as Pope. The university was closed in 1939 following the invasion of Poland by Nazi German troops forcing Wojtyla to work as a messenger and a manual laborer between the years of 1940 to 1944. Following the death of his father, Wojtyla began to seriously think about being a priest which prompted him to pursue his interest at the Bishop's Palace in Kraków in October 1942. While Wojtyla was still working at the chemical factory, he attended illegal seminary classes taught by Adam Cardinal Sapieha for two years. In 1944, Wojtyla narrowly escaped a Nazi roundup of young men by hiding in the basement of his uncle's house before retreating to the archbishop's palace where he spent the rest of the war days. Wojtyla was ordained to the Catholic priesthood by Sapieha in November 1946. Wojtyla studied in Rome for two years completing his first doctorate, in the next decade he got his second doctorate and taught ethics and theology at his former university. Eventually, Wojtyla attained full professorship at the Catholic University of Lublin. Before becoming pope in 1978, Wojtyla was appointed auxiliary bishop then archbishop of Krakow before he was appointed the cardinal in June 1967. Pope John Paul II, directed the rewriting of some major church texts including the Roman Curia and the Code of Canon Law. The Pope also encouraged and admired scientific research for truth but gave warnings about the misuse of science that would undermine human dignity. Pope John Paul had a plethora of teachings that significantly impacted the Catholic Church, Christianity, and the society as a whole. As a young boy Wojtyla experienced the death of almost all of his immediate family members by the time he attained the age of 20 he had lost his entire family. John Paul witnessed first-hand cruelty under the reign of Nazi Germans which saw the massacre of many people both Jewish and non-Jewish, political leaders, priests, and professors. John Paul encountered two accidents in 1940, one of which left him with a permanent stoop. 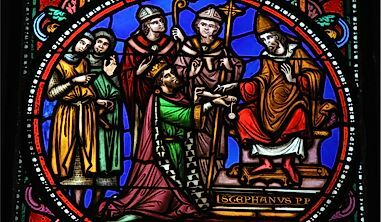 During his tenure as Pope, three attempts were made on his life the first one critically wounded him. During the early 1990s, Pope John Paul who was once robust was slowed down by Parkinson's disease. Despite his health issues the Pope kept to a rigorous schedule and insisted that visible suffering was part of his ministry. The Pope developed septic shock, high fever, and low blood pressure after contracting a urinary infection on March 31, 2005, and the Pope died on April 2, 2005. Upon his death, the Pope was referred to as 'John Paul the Great.' During his 26 years of papacy, John Paul touched the lives of many people through his teachings and writings such as the revision of church doctrine, declaring sanctity of life, and condemning sexual immorality among many others. Several institutions are named after him. Was Pope Joan, The Female Pope, A Real Person Or Just A Myth? 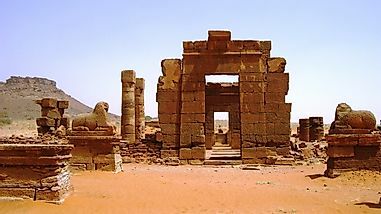 Who Was the Oldest Pope Ever Elected?